Here at Carlisle Air Automotive in San Antonio, we recognize that regular oil changes are one of the most important maintenance tasks for your vehicle. It’s critical that you adhere to manufacturer guidelines when it comes to this routine service. If ignored, engine oil will become excessively dirty and sludgy which means it can’t perform its job of keeping your engine properly lubricated. Without proper lubrication, your engine’s bearings, cylinder walls, cam lobes, and other moving parts will prematurely wear and, in extreme cases, fail completely. For this reason, we take the utmost care when it comes to oil changes on your car, truck, or SUV. We use quality motor oil and filters tailored for use in your vehicle to ensure all of your engine’s moving parts are properly lubricated. This small investment goes a long way in preserving the performance and extending the life of your vehicle. Our professional mechanics don’t simply perform an oil change, they truly care for your vehicle. While the manufacturer recommendations for oil type and change intervals are an excellent source of information, as a vehicle ages, it may require a different approach. That’s why our mechanics will assess the overall health of your vehicle and the conditions you drive in to make their suggestion on oil type and change interval. By doing so, they can help extend the life of your vehicle and ensure it’s always running at its best. In addition, our technicians will also check and inspect common wear items on your vehicle. If any other parts are due for repair or replacement, we can arrange to have it done at the same time. This is another example of why at Carlisle Air Automotive you receive more than just an oil change – you receive complete car care. We understand that everyone’s life is busy and sometimes it’s hard to find time to bring your car in for an oil change. However, it’s crucial that you don’t delay this vital service because it could cause irreversible harm to your vehicle’s engine. 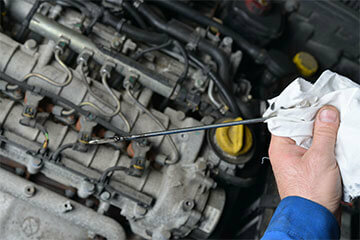 Preventative maintenance does wonders for the overall health and longevity of your vehicle. That’s why we make oil changes as quick and convenient as possible by providing a welcoming and comfortable environment while you wait. Our professional and courteous staff treats you like family and your vehicles like their own. Don’t hesitate – give our South San Antonio location a call right now at (210) 922-5991 to speak with one of our friendly service advisors about scheduling your next lube service, or visit us at 1291 New Laredo Hwy.